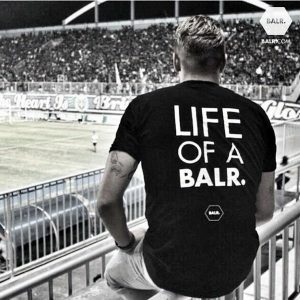 BALR was founded in 2013 by professional football players Demy de Zeeuw, Eljero Elia and Gregory van der Wiel and is a luxury fashion brand. Based in The Netherlands the clothing line currently consists of t-shirts, headwear, footwear and accessories. Demy Patrick René de Zeeuw is a Dutch footballer who plays for NAC Breda and the Netherlands national football team. He spent the majority of his football career with the Dutch league. Eljero Elia is a Dutch footballer who currently plays in the Dutch Eredivisie for Feyenoord. Gregory van der Wiel is a Dutch international footballer who currently plays for French club Paris Saint-Germain. Currently the brand has an A-list group of people who are endorsing the products. Football players include Arsenal’s Hector Bellerin, FC Barcelona’s Daniel Alves da Silva as well as Munir El Haddadi, Chelsea’s Alexandre Pato, Valenica CF’s Shkodran Mustafi, K.V.Oostende’s Gohi Bi Zoro Cyriac, and Zulte Waregem’s Willie Overtoom. Other clients include world famous DJ’s Tiesto and Martin Garrix. BALR is also associated with the companies Wannahaves and 433. Wannahaves, is “a luxury lifestyle magazine about beautiful products, fascinating places and unforgettable experiences.” 433 is “the latest football news, live match coverage and awesome videos.” It is one of the largest social sports communities in the world. 433 has accounts on Instagram, Twitter, and Facebook.